...3 lucky stampers who came to my Retirement Party last night! 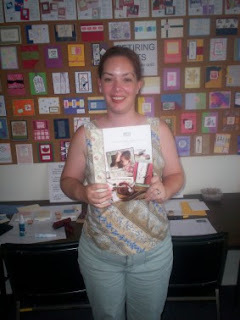 Diana Y. won the "Mini Mates" set. Tomorrow is not only CANADA DAY (wooohoo!) but the launch of the new Fall/Winter Collection. Stay tuned to be able to start browsing it online beginning the 1rst, and keep your fingers crossed that my cases will be delivered on Tuesday July 3 when Canada Post resumes delivery, and I resume my stalking of them. It's here, it's here... my darling enchanting new catty is here!!! Please note, this is NOT from my pre-order of 8 zillion catties that are coming from the printer. Do not descend like locusts upon me! 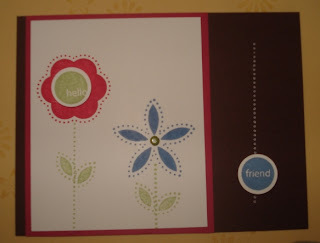 This is simply the complimentary one that all Stampin' Up! demonstrators are sent. I will be sending out an email to all of those on my Canadian e-newsletter list the moment those ones arrive... I promise. Until then, I am off to be one with my new best friend -- CIAO! 2 more cards + a big fat pout! Who's that sad sack, sorry faced girl I see in the mirror? Oh wait, that would be me.. pouting that I still don't have my new catalogue yet. 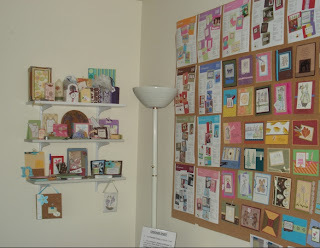 Here's hoping you read a MUCH MORE upbeat post from me later today :) I'm off to start sorting out the swap cards for everyone and then update my card sample wall with current sets. 1. At the distribution centers, please be on the lookout for SUDs. In the past they have been known to cut fences and sneak inside covered with close to cocoa ink in hopes of blending in with the trucks. 2. The ladies have been known to run after your trucks. If they catch you and ask if you have a "package" for them, be careful with your answer. They do not take "no" for an answer. If you do not have it, just say "I will double check in the back" and turn and run as fast as you can to your truck and drive away. Do not turn back and look, just keep going until you are a safe distance away. 3. They have also been know to drive up next to you at a stop light in their mini vans and SUVs and ask if you have a package for them. Turn up your radio and pretend you cannot hear them. Do not let them approach your delivery truck at an intersection. SUDs have been know to stop traffic and throw all your packages off the trucks until they find their new Idea Book and catalog. The UPS corporation is informing you of this because in the past years, SUDs have been known to scream at the top of their lungs with excitement and try to tackle you with hugs for delivering their catalogs. After you have been smothered with appreciation for getting them their catalogs on time, watch out for flying packaging material as they will open up the box before you have had a chance to leave, or they have gone inside. Let's Be Safe Out There!!!! 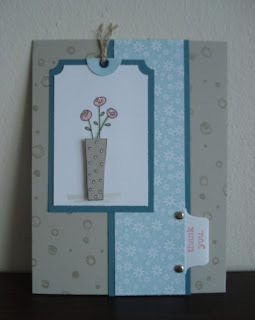 Today's first two cards were created by Robin -- she chose "Garden Silhouettes" & "Vases in Vogue" as her featured sets -- both are hostess sets that are coming in the new catty. 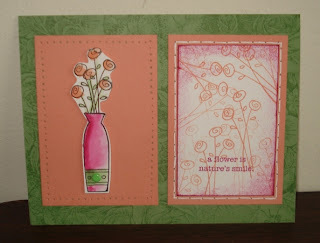 She even used Wild Wasasbi and Groovy Guava as her focal colours in the 2nd card. Groovy indeed, Robin! 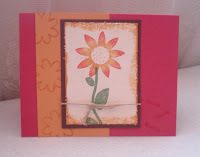 The third card was made by Cheryl F, using another one of our new hostess sets. 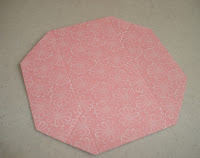 I love the raised punched-out circle elements... very cute! Word on the street is that the complimentary demo catalogues are due to arrive in today's mail (well, today or tomorrow but I prefer to be optomistic!). I'm hoping the 19 cases worth of catties that are being shipped directly from the printer Stampin' Up! uses won't be too far behind, as we have some mighty anxious stampers who are chomping at the bit for them! Keep your ears twitching today for the sound of ecstasy coming from the east-end of Toronto -- hopefully that will be me! 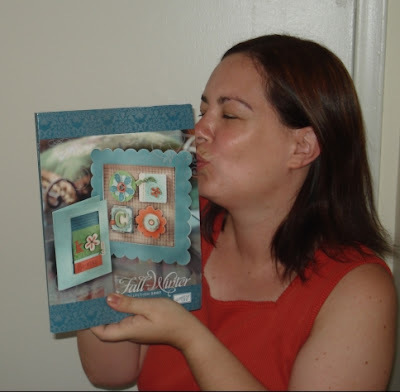 To end today's little note, here's a picture of me from LAST year when the new catalogues arrived and I had to bury my nose in it ASAP. I guess this is one of the last times you'll see me with this one, eh? Here are 2 more swap cards to share... the last of them are due in tomorrow (Monday) so I'll have some more to post here in the days to come! 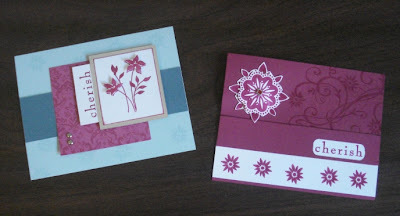 The eggplant card is by Helayne, using the new "Pick A Petal" set. I love that this set has 10 different pieces with it and is soooo cute! Joyce used the new "Year after Year" set for the cake, a new dotted Jumbo wheel "See You Around" down the side & the words are from a new greeting set called "Hugs & Wishes". I've been using it a LOT already :) Thanks gals! 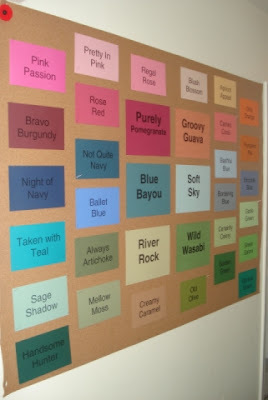 I cleared out the old hostess card samples (prepping to give them all away next week) off the hallway cork board, and I've put up a cardstock display of the 6 new "In Colors" for 07/08, along with some coordinating colours along side them for comparison. Hopefully seeing the colours live and in person will help you see who deliciously scrumptious they are! 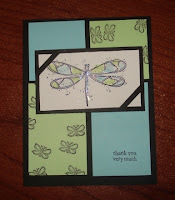 Enjoy the rest of your weekend, everyone and HAPPY STAMPIN'! 2 new cards + Studio is almost done! 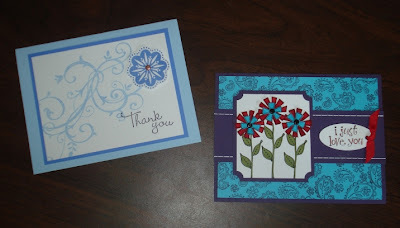 Here are 2 more swaps I received yesterday, both by Deanna Tam - a talented demo from Vancouver, BC. 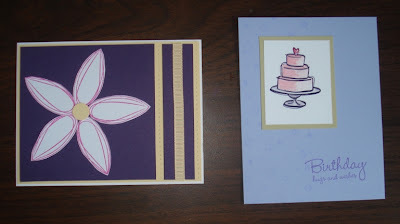 The first card is a beauty using "Baroque Motifs" and the second is from an upcoming set called "Double Line Doodles". 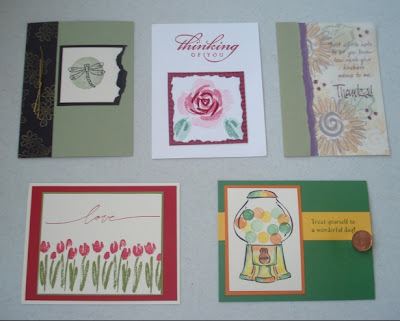 That's a whole lot of cutting out that you did for the petals, Deanna, but the cards look stunning! As for the studio re-org... it goes on and on. I hit the hardware store and ended up with a 4'x10' length of cork, and had fun (not) staple-gunning it to the wall. 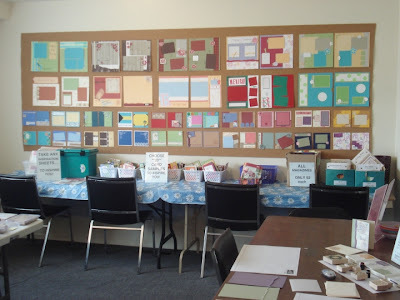 Once it was up, I turned it into the "Wall of Scrap" -- nothing but 12x12 and 6x6 scrapbook layouts to help inspire the scrappers who visit. If you haven't checked my Calendar of Events recently, go take a peek.... with both Serena and Morgan attending daycamp this summer, I have LOTS of classes and fun stuff planned for you all. If you are interested in a specific class and do not see it listed, email me -- I'm sure we can work something out! Today's offerings are from Diane Cooper and Joyce Taylor (please click on image to enlarge). 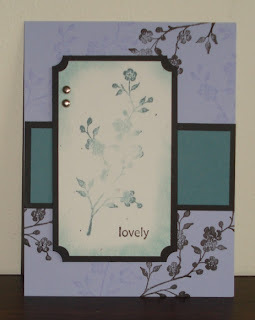 Diane's swap card featured "Garden Silhouettes" (a new hostess set) and "Baroque Motifs", with a beautiful combo of new "In Colors": Soft Sky, Blue Bayou & River Rock all paired with some yummy Rose Red. 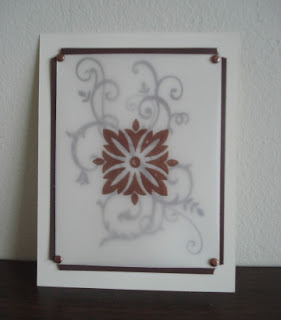 While it might be hard to see in the scan, Diane cut the 2 larger flower blossoms out and mounted them on dimensionals to give extra oomph to the card. Joyce's card features "Baroque Motifs", Purely Pomegrante colour and the new rhinestone brads in a pretty monochromatic scheme. In other news, the studio re-org is progressing along at a nice clip, although I'm feeling the rush today to get everything done in time for Saturday's Hostess Appreciation party. 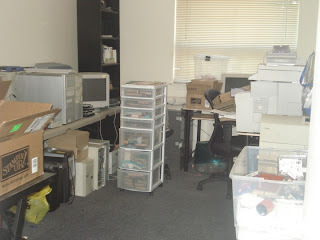 It sure looks like a bomb exploded in here, what with all the piles & shelving/furniture moving willy-nilly. 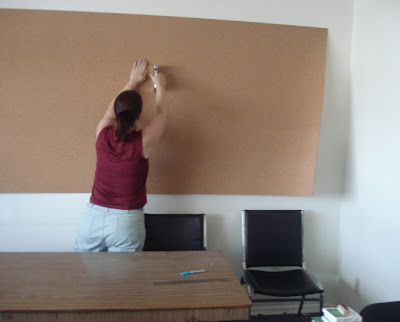 My goal today is to get the new 8 feet of corkboard to go up on my opposing wall to add more samples, create a display of the new "In Colors" and of course, finishing putting everything back together... easier said then done. I have 3 different delicious Dufflet pastries arriving for tomorrows party (hehe, is it bad I'm almost as excited about the food as the stamping?). I'm trying to finalize what projects we'll be making and then if I have any left-over time (ha) I'll start getting ready for the final blow-out event of the year which happens next Friday! Hmmm, and somewhere in between all that I'll also host my teams annual New Catalogue Pizza Party, where we get together and OOH & AAH over our new delicious catties. What could be better -- I can't wait until they come! p.s. Here is the updated Retiring Accessories list... the colour legend works like this: Green = Sufficient supply; Yellow = going fast; Red = sold out. I know some items are already gone so you need to be quick! Contact your Stampin' Up! demonstrator to order before they're gone for good. Well, the retiring Accessories list is here and it's a DOOZIE. The accessories listed below are only available while supplies last and will be retired after June 30. Please don't hesitate to contact me or your local Stampin' Up! demonstrator if you need more information! 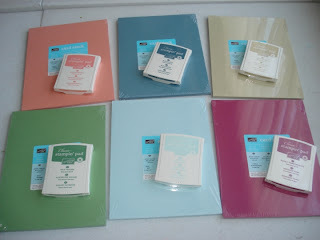 Much as I'd love to just dive in to all the new goodies I received from the 2007 Preview Brochure, that will need to wait until next week since I'm busy mocking up the cards we're making at tomorrow's 10 Card Camp. We're playing with retiring sets & colours all day long, so it should be fun! To whet your appetite, here are 5 of the 10 cards for Saturday. She'll be joining me next March when we sail from New York City on the MS Noordam to sunny Bermuda. I won't say who she is yet since I'm sure she'll be wanting to announce the news first, but I'm SURE you've visited her blog before (if you visit the ones on my blogroll). Let's all wish her a heartfelt "FELICITATIONS"! Happy Monday, everyone!I hope you all had a lovely weekend, I know I did. 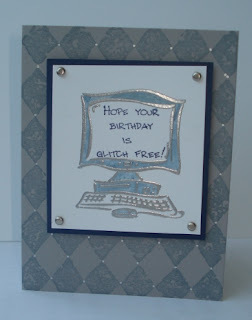 The first of the card uses "Computer Quips", a set I dearly love to use for all the geeks in my life (and I have quite a few!). We embossed the computer in silver and just used the Bashful Blue marker to colour in. 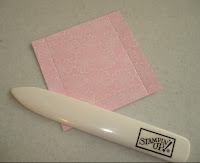 The Stamp-a-ma-jig tool comes in handy for accurately stamping words in tight spaces, like on the monitor's screen. 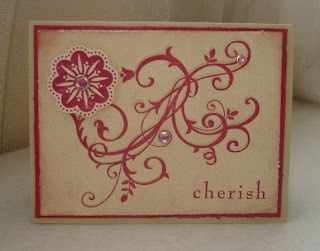 Card 2 uses the "Celebrate in Style" set, another retiring gem. 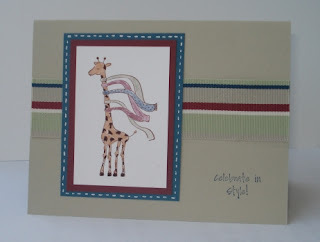 I typically use this set for the octopus with purses or catepillar of many shoes, but the giraffe with all the ties really spoke "Father's Day" to me (inspired by Mistoffoleese's card using a different ribbon). I call this one my "Manly Man" card I was inspired when I saw lbenden's card on SCS. I love using one of the stamps from "All in a Row" when I want the appearance of faux-stitching. We used the Watercolor Wonder Crayons on our watercolor paper and even *I* couldn't screw it up that bad (and I'm lousy at watercoloring). 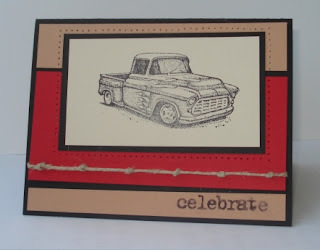 This card using "Classic Pickups" was pretty much a straight CASE from Jen70's "Classic Convertible"s card, except for how I knotted the hemp along the bottom. We also used a marker to ink up just the main word "celebrate" from the "Lexicon of Love" set. 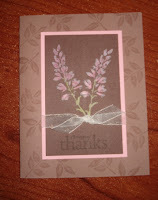 This final card was done using the origami shirt fold with some of our designer paper. 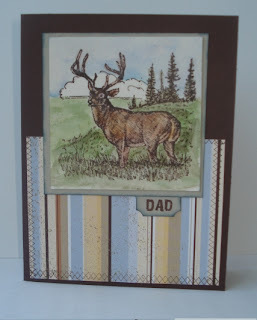 I got the idea from heyheypaula's card and then found a step-by-step tutorial on Cambria's blog. 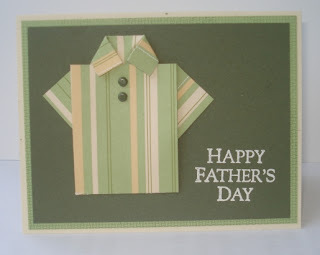 Once you have the folds down pat, it's an amazingly simple shirt to make... I plan on adding a tie and maybe a pocket for the next one I do! Some of you have asked me how the studio re-org is going, and I'd have to honestly say: SLOWLY. While the kitchen area is done, I'm still moving around the are in my office where my main shelves will go in, plus trying to clear out my husband's staff room so that I can move my stamping nook in there. See what a disaster it is right now??? I need to clear it up first before I start moving the big furniture about - maybe this week when my biz taxes are done (those of you who Facebook know I've been working on them for days now!). I did get the first of 3 smaller wall shelves up, where I'll be displaying those cool 3-D items I keep swapping for. 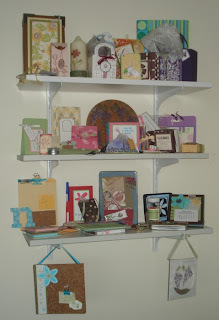 You know, the neat-o books, bags, doodads and goodies that you can make with stamping and scrapbooking stuff. Hopefully I'll have some new SNEAK PEEK goodies for you to see tomorrow, as the Man In Brown should be bringing my humongous pre-order in later this afternoon :) Yeah for me! What are you doing in March 2009? How does HAWAII sound to you!!???? While on the recent Panama Canal incentive cruise, we learned that the 2009 Stampin' Up! trip will be to the Big Island of Hawaii, for a 5 day stay at Hilton Waikoloa Resort. Now doesn't THAT sound exciting??? Explosion boxes are super-easy and tons of fun... a couple of quick scores and folds and you're basically done. 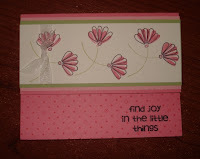 I like making them with Stampin' Up! 's double-sided patterned paper because they're just that much faster to make if I don't have to stamp them myself! LOL ... I'm such a cheater. 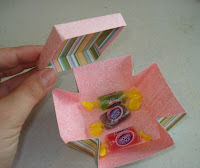 Anyhow, if you ever want to make a cute little box for candies or another small item, look no further - and let me show you how to make them. Step 1: Let's start with the lid! 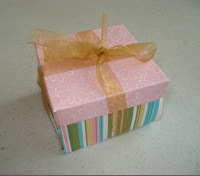 - Start with a 3.5” x 3.5” piece of Patterned Paper. 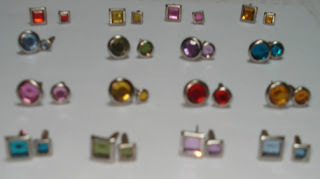 - Score a line at the 3/8” mark on all sides. Cut up along the score line once per each of the four corners to create tabs (the bold black lines on lid diagram indicate where to cut). - Fold along score lines to form lid. Secure tabs to the inside of the lid with adhesive. Step 2 - The BOX! 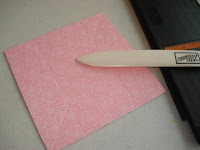 - Cut your patterned paper down to 5.5" x 5.5". Score at the 1.5" mark on all 4 sides. - Score all 4 corners so that it's on the diagonal (see diagram above). Step 3 - Trim corners. - Fold in on score lines to create box shape. 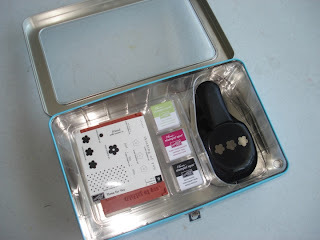 There's no need to add adhesive to hold together.. the lid will keep the box in place. 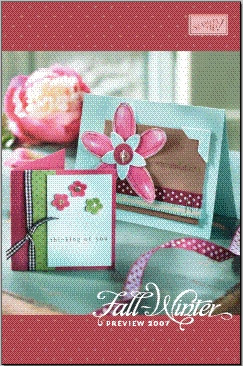 Later today I'll post the projects that were done at the recent Palette O' Prints classes but in the meantime I'll be getting tomorrow's "Card of the Week" email prepared. If you aren't already registered to receive it, please feel free to sign up (on the left) to have it sent to you!